If you are interested in ownership of a master franchise or master franchising, you will discover information on owning the best franchises, how to purchase a single franchise, buy multi-units, locate a business for sale, become a multi unit franchisee, area development investing, grow to be an area developer, territory developer, regional developer, invest in a master franchise and purchasing a master franchisor territory. As a small business owner starting out, you will find concepts at various investment levels and franchisors will assist you with info on making a decision as well as how to own and develop your franchise after the buying process. Eight years ago we stumbled over a unique business system that has brought unbelievable success to it's owners. Although very rare, those that were using it were not only experiencing a high success rate but also a very nice level of earnings. We found that there is very little detailed information about this type of business. Out of tens of thousands of business books there has only been one book written about this type of business, to our knowledge, and it is very hard to lay your hands on. No accurate database exists, that we have been able to find, which list these opportunities. Imagine coming up with the idea of a new franchise concept that explodes in your area with dozens of new units opening up. Imagine having control of this concept and receiving royalties and franchisee fees on a consistent basis. Imagine having an idea like McDonald's and having people line up at your door to buy your opportunity. Imagine having access to the best business experts to help guide you in your new venture to build your organization to last. This opportunity is extremely rare, yet there are such businesses available if you know where to look. This unusual, highly successful opportunity is called MASTER FRANCHISING. With master franchising you get all of the benefits mentioned above but without the expense of having to develop the concept from scratch. You get control of the successful franchise system in a specific geographic area, a proven track record that works, the brand name and even a partner in the form of a corporate office and other master franchisees to give you valuable support, latest innovations and business expertise when you need it. 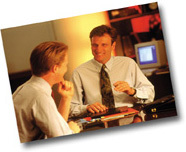 Franchise Fees - When you sell a franchise, you receive a franchise fee. Most franchise fees are between $25,000 to $35,000 and in a typical master franchise program, you keep most of the fee! Ongoing Royalties - This is the ultimate income source. Once you help set up the franchises, you receive royalty income or annuity type income for the rest of the life of those franchises. Imagine receiving 2% to 5% of your franchisee's volume every month. Products or additional services - Often products or additional services needed by the franchisee's outlet can bring excellent additional income. Real Estate - If real estate is involved with the franchisee's location, often the master franchisee can become involved in the development of sites and receive other types of real estate related income. Very few employees. Typically you will operate a master franchise by yourself and then expand to have an administrative assistant, a trainer or other support person and a franchise sales person. As your master franchise grows larger you may need to add more staff, perhaps a general manager to run the operation so you may back away almost completely, if desired. We have found that many master franchisees, after having worked for three to seven years, can semi-retire and live off of an extremely good income and spend one or two days a month in the office. Best of all - it is a franchise! Franchises as a whole enjoy a high success rate. Master franchises typically have an even better success rate than the normal franchise. All you need to do is find the right master franchise for you. Master Franchising or regional development franchises, as they are sometimes called, are the best kept secret in business today� for the right person.